After spending so long with the good but bloated new Metallica album, I felt a real need to sink my teeth into something less fatty, something truly streamlined and straight to the point. Well, look no further than Polish death/thrash institution Vader, here on their twelfth full-length which comes in at a trim thirty-three minutes, pounding out exactly the sort of razor-sharp old-school metal required. Like a jackhammer to the skull, this is metal at its most lean and honed, played by real veterans of the scene who have been active as a band longer than I’ve been alive. And it’s as instantly enjoyable as you’d expect, blasting openers Angels of Steel and Tempest coming in and wrecking the joint in barely over two minutes each. Driven by the whiplike double-bass-heavy drumming of James Stewart, the death metal here is riff-fuelled first and foremost, ferocious moshpit neck-crackers like No Gravity and the awesomely-titled Genocidius. Vader’s biggest influence even now is probably Slayer, but Vader have never to my ears sounded as grey and tired as Araya & co’s recent outings – the ripping energy that bursts forth from Angels of Steel is incredible, while an epic breakdown partway through Tempest is truly vicious, leading to wild soloing and, of course, uncontrollable headbanging. 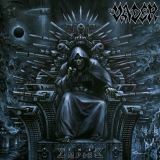 Vader are the sort of band who get foolish criticism for writing the same album over and over again, but given familiarity with them, it’s easy to appreciate not just their consistency but the way they switch gears here, like the slightly slower, rumbling intensity of Prayer To The God Of War and Iron Reign keeping up the heaviness without resort to the groove that other bands would add. There’s none of the orchestral flourishes of previous albums here, the band instead using the guitars for moments of Star Wars-esque melody like at the end of Genocidius, and interesting forays towards a more technical sound on The Army-Geddon that sounds more like something from countrymen Decapitated or even Behemoth. (Not forgetting, of course, the massive influence that Vader had on them, and a lot of metal bands out there!) Yet the secret MVP of this, and indeed every release from the band, is frontman and guitarist Piotr Wiwczarek. Not content with merely cranking out the killer riffs, he also has the sort of bellowed growl that works perfectly with the music, angry and violent yet with a human edge, anthemic and threatening all at once. He sounds as good invoking an uprising in The Army-Geddon as he does when grunting Tom G Warrior-like at the start of Feel My Pain – really, no-one quite sounds like him, a very underrated vocalist and a vital piece of the Vader puzzle. And when you have an all-killer, no filler set of ten songs like this, topped off with one of the coolest pieces of album artwork I’ve seen in a long time, what can you do but applause wholeheartedly? Metal is often about the spectacle, the legendary band returning with a giant double-album allowing us mere mortals to bask in their gleaming ego, but let’s not forget, the genre is often at its best when it’s something you throw on with a beer after a long day at work, a set of killer songs in the half hour’s relaxation you have before real life intervenes again, a little slice of escapist awesomeness to make your life that little bit better. Vader may not get Metallica’s mainstream hails or sales, but there’s more metallic meat here for those who can appreciate it.